London, 31 March 2017 — Prominent climate scientists tell US Congressional committee that climate science isn’t working, but can be saved by a “red team” approach. 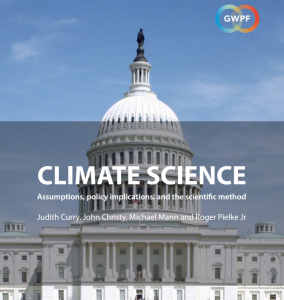 A group of prominent US climate experts have told a Congressional committee hearing that climate science is dysfunctional, beset by bias and groupthink, and is using a profoundly unscientific approach. Speaking before the U.S. House Committee on Science, Space and Technology, Professor John Christy told representatives that “consensus science”, as practiced by much of mainstream climatology, was “not science” at all, while Professor Judith Curry explained that “self-deception” had got the better of far too many climatologists. Both concluded that there had been a wholesale failure to use the scientific method in climatology, something that could only be put right by the introduction of official “red teams” – groups of eminent scientists, who would be asked to challenge and provide dissenting opinions on official climate assessments. The testimony of all four climatologists who spoke at the congressional hearings, including the dissenting views of Professor Michael Mann, are being republished by the Global Warming Policy Foundation, the London-based think tank which seeks to enhance the public debates on climate science and policy.